Looking down the nave from the crossing in front of the high altar is the best way to see the great rose window of the façade, above the organ gallery. In the centre of the great window is the Blessed Virgin with the Holy Child; around her, angels bearing incense. 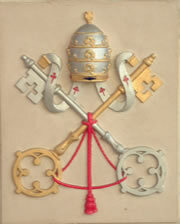 In the outer circle are the fifteen Mysteries of the Rosary. 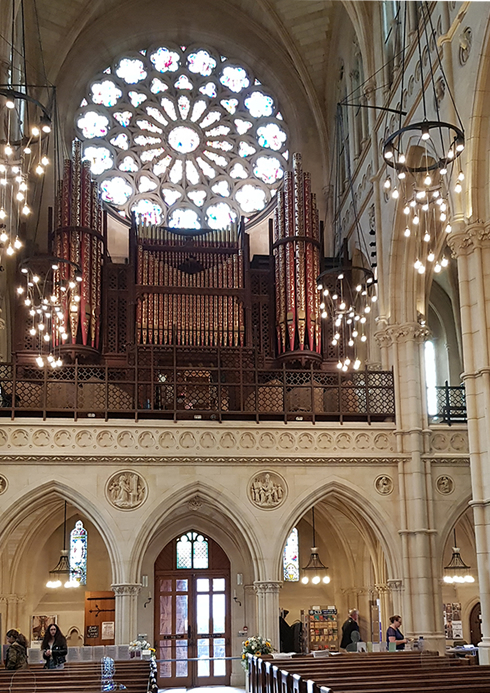 The organ was built for St.John’s Catholic Church, Islington, but was installed at Arundel in 1875. Some alterations were needed to the casework to avoid masking the lower part of the Rosary Window. Roundels carved below the organ gallery represent angels with musical instruments, except the two larger roundels, which are (left) St. Cecilia, patroness of musicians and (right) Pope St. Gregory the Great, who did much to foster plainsong. ‘Gregorian Chant’ is named after him.